It's always fascinating to see old artwork and photos of Interiors of the Past. It's hard to believe that people lived in such simple spaces, yet things seemed so much less efficient and time consuming. A simple task like making bread involved working in a kitchen space with no counter space-- typically a butcher block type table that was used for all things kitchen related. There are things we forget we take for granted in modern times, such as having plumbing. 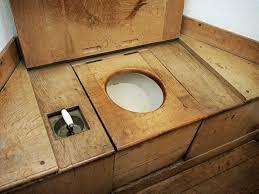 This old-fashioned commode typically would be located in a closet-like space with no sink for hand washing. It's hard to imagine that composting was their method of disposal without the modern techniques used in composting today! One trend from the past, is the mounting of pictures hanging from wire to the crown molding. Back in the day, homes were often made of lathe and plaster, which didn't allow for nails to go through the walls. Their solution was to hang their favorite art and photos from the molding. It's still to this day, such a classic look! Fast forward about 70 years! 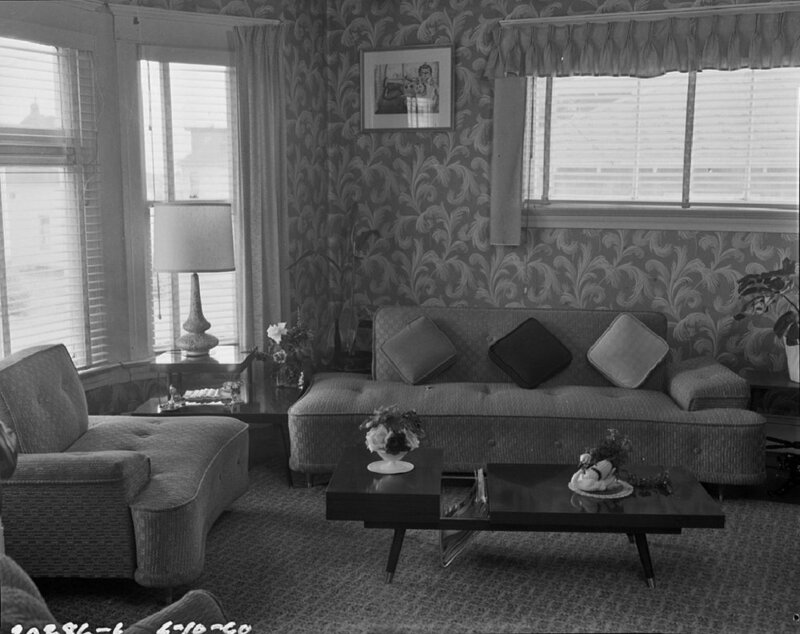 This living room from the fifties truly shows the essence of when times were getting better economically. Comfier furniture, warmer feeling interiors, clean and streamlined shapes and fun, organic patterns were the new trends. The coffee table with the built in magazine rack is something you would see today in a modern furniture store. Amazing how time repeats itself! Do you have something you remember from past interior design? Something you'd like to see have a comeback? We would love to hear about it!